We have been able to spend five days visiting a number of villages and markets in the northern mountains, far away from any sort of modern conveniences. Our guide, Cao, is from a town on the Chinese border who knows the area well, and can speak some of the local languages. He makes us breakfast and lunch every day, using bread and Laughing Cow cheese that he brought from the south, local eggs, local greens and hacked chicken, and noodles and rice. We eat on little tables tucked onto open porches on the street. The diversity of the tribes is amazing. Most of the country’s minority groups live here – eleven million people comprise 53 different ethnic groups that are further divided into multiple subgroups, giving Viet Nam the most complex ethnic makeup in Southeast Asia. Many of the tribes have migrated from regions of China, but some share racial characteristics with Indonesians and other island peoples. 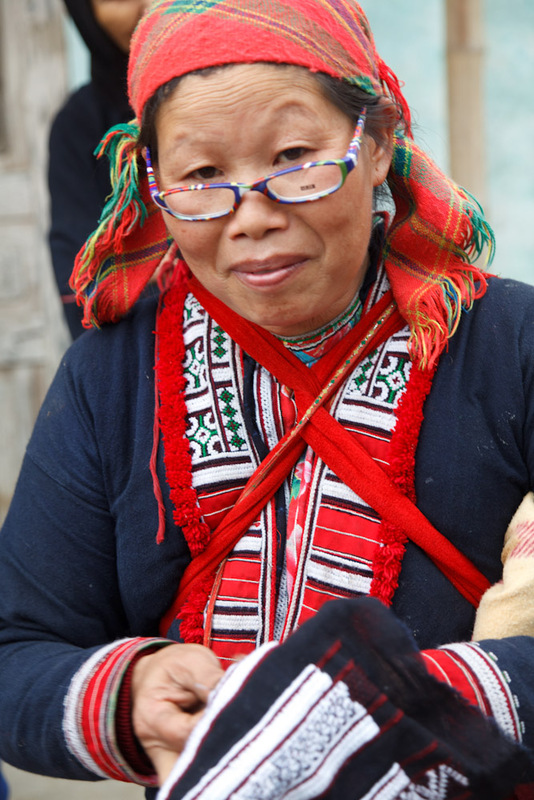 Despite diversity of tribal origin, dress and language, their lives are similar. Most of them stay always close to home. Farms have been created primarily by swidden farming – slash and burn trees, clear and terrace the land. These mountains were once heavily forested, but over years they have been stripped then planted. Traditionally, a family carries soil up from the valley or moves every few years, as the soil depletes. The work is arduous, and everyone participates. Children are unsmiling and sober, expected to work along with their parents when they are young, and to take care of them when they become adults. The food here is mostly vegetables: rice, corn, cabbage and greens. Every inch is planted – a couple of square feet of soil at the edge of the road will have three or four stalks of corn. In the larger terraces, two crops of rice and one of another vegetable are planted each year. Some families have a few chickens, and occasionally a pig, but malnutrition is an ever-present problem for the region. Life is dependent on weather and luck. The houses are partially open, and usually have only a couple of low-watt bulbs to light inside, so the weather outside – cold, rain, whatever – is what the people live in. It affects the amount of food they will have, and their health. Our guide visited a friend whose wedding he had attended last year. The man had lost four water buffalo and two cows to the hoof and mouth disease that was rampant in the cold, wet winter that just ended. Without water buffalo it is impossible to farm effectively. We brought several different gifts with us on this trip. We gave out candy for the children everywhere. The older children take it, then share it immediately with their younger siblings; different from most countries where they grab as much as possible then horde it. Balloons were a big hit. But most rewarding was the gift of reading glasses. You see no spectacles here at all, on young or old people, so we picked up a dozen pairs of inexpensive reading glasses in Hanoi. They were mostly taken by women, who continue embroidering as long as they can see, but there was one man who just kept looking at his sleeve and his watch, grinning broadly.